As we near the centennial anniversary of Hollywood’s Golden Age, the stars of Tinseltown’s black and white era have taken on somewhat of a folklore status. While still a popular subject among fans of classic films, when looking back at these former screen icons, rumors are subject for interpretation. For these stars, time has proven to be the gateway to immortality. While certain truths get blurred as time goes on, these tales only add to the legendary mystique of these iconic stars. It all started in 1941. The film was I Wanted Wings, a military suspense drama starring Ray Milland and William Holden. The film also starred a newcomer named Veronica Lake. Lake’s performance immediately catapulted her to stardom, and as a result, would inspire a fashion trend that would sweep the nation. Lake played nightclub singer Sally Vaughn, but it was her natural beauty and long cascading hair that stole the show. In one scene, her hair fell over her face obscuring one eye, and just like that the Peek-a-Boo hairstyle was born. Being relatively unknown at the time, studios across Hollywood all wanted to know more about “the girl with the hair.” That sultry and mysterious look launched Lake’s career into Hollywood stardom. That same year Lake would also star in the comedy Sullivan’s Travels opposite Joel McCrea. The film screened for critics on December 4, 1941. Three days later the Japanese would bomb Peal Harbor, setting in motion American’s entry into WWII. The war would change the aspects of life for all Americans, including Veronica Lake’s signature hairstyle. The following year Lake starred in three more films, and in each movie her hair seemed longer and wavier than the last. In I Married A Witch, her long locks practically seemed a character of their own. Paired with her natural comedic charm and good looks, it became one of the most successful comedies of the year. By the year’s end, salons were specializing in the Peek-a-Boo hair style while hundreds of women were spending hours in the mirror torturing their hair, trying to perfect the Veronica Lake look. Lake also had a cameo in the patriotic musical Star Spangled Rhythm, in which she co-sings the song A Sweater, Sarong, and Peek-A-Boo Bang with Paulette Goddard and Dorothy Lamour. The song was specially written for the actresses by Johnny Mercer and playfully pokes fun at each girl’s rise to fame on the silver screen. While the wartime efforts were taking shape overseas, photos of Lake were popular with the soldiers. Pinups of Lake were hung on barrack walls next to the likes of actresses Rita Hayworth and Betty Grable. Using her popularity to help the cause, Lake and her golden curls made appearances across the US to raise money for War Bonds. As more and more men were drafted, the demographic of America began to change and called upon women to take the jobs normally performed by men. 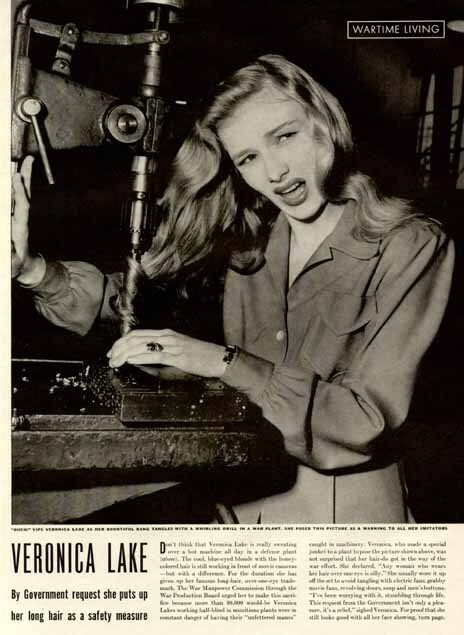 Before Rosie the Riveter immortalized the now classic look of the wartime female worker, quite a lot of women entered the workforce doing their best to look like Veronica Lake. A machine filled warehouse of long locked women quickly proved to be hazardous. It got to be such a problem that the US government contacted Lake and asked her to change her hair to a more practical style for a working environment. Lake agreed and appeared in a PSA film that featured a stylist putting her hair up into tight rolled braids behind her head. A staged photo was also taken of Lake with her hair entangled in a drill press to highlight the dangers of unkempt hair when dealing with machinery. Often shown during news reels before a motion picture, Lake’s PSA helped in the rapid decline of hair relate work injuries. As the war waged on she continued to wear her hair up, and would only display her long locks for the camera. Subsequently the Peek-a-Boo hairstyle quickly lost popularity, and unfortunately was one of many contributing factors to Lake’s decline in Hollywood. Yet to this day, the memorable style remains one of the most endearing from Hollywood’s Golden Age, solidifying Lake as one of the original blonde bombshells of the industry.